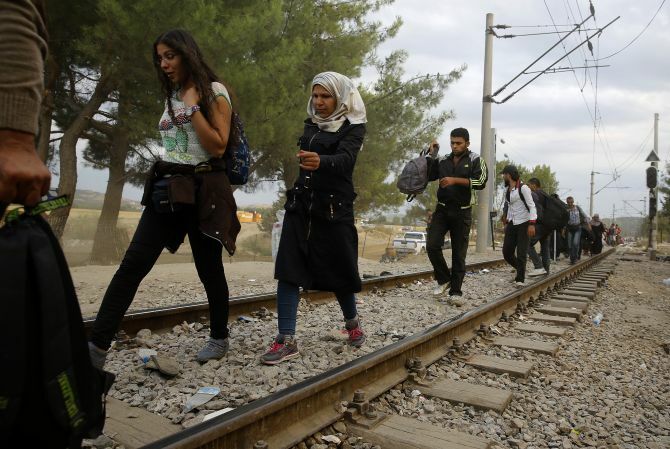 European leaders are searching for solutions as conflicts in Syria and Iraq are sending thousands of refugees on dangerous voyages through the Balkans and across the Mediterranean to the 28-nation European Union. Here are the latest developments on the crisis. European Union President Donald Tusk has said that the current movement of people mainly from the Middle East would be a problem for many years to come. The present wave of migration is not a one time incident but the beginning of a real exodus. Urging for pragmatism, Tusk said that member states must put aside their deep differences in facing the crisis. On Monday night, migrants, tired of waiting for buses at Hungary's first refugee holding centre, broke through police lines near Hungary's southern border with Serbia and began marching towards Budapest. Officers offered no resistance as about 250 migrants reached the M5 highway that connects Serbia and Hungary. On the Greek island of Lesbos, fresh clashes erupted between police and refugees, which the Greek Migration Minister Yiannis Mouzalas warned was "on the verge of explosion." A dozen or so coastguards and riot police armed with batons struggled to control migrants on the island, screaming "keep back" at the crowds as they surged towards a government chartered ship bound for Athens. The Greek government and the UN refugee agency have brought in extra staff and ships to deal with some 25,000 stranded migrants on the island of Lesbos. A processing centre has been set up on an abandoned football ground to help the migrants to get to Athens, BBC reports. In southern Denmark around 150 migrants have tried to march towards the Sweden border, forcing the police to close a motorway. Austria has announced that it plans to phase out special measures that have permitted thousands of refugees to travel from Hungary to Western Europe. The Daily Star quoted Austrian Chancellor Werner Faymann, as saying that they will gradually remove emergency measures for asylum seekers. German Chancellor Angela Merkel thanked volunteers who had welcomed those arriving over the weekend, saying they had "painted a picture of Germany which can make us proud of our country." The Hungarian parliament last week passed tough new legislation on illegal immigrants. Hungary, along with the Czech Republic, Slovakia and Romania, has rejected the idea of official quotas from the EU. The EU has stepped up naval patrols off war torn Libya, the source of many migrant tragedies at sea. There are plans to destroy the people smuggler boats. The UK government is emphasising the need to stem the flow of migrants at source, to stop their perilous journeys to Europe. The United States government said that it was considering a range of approaches in response to the global refugee crisis including with regard to refugee resettlement. Which country has accepted the most asylum applications? Europe's refugee crisis: Which country has accepted the most asylum applications? Did Gujarat board invent a Quranic verse against killing cows?